we designed a high-speed (up to 200 mm/s) robotic system with a range of 200 x 200 x 100 mm, perfectly adapted to coat standard sbs plates. all the moving parts are placed above the spraying area, effectively avoiding contamination. 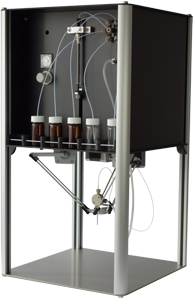 the spray arm consists of 7 parts, which can easily be disabled for cleaning. the iMatrixSpray comes with a intuitive web interface and provides its own wlan access point. it can be controlled with a pc, tablet or even with a mobile phone. the user can generate a spraying method by defining the spray parameters, or can download, save and execute a custom g-code file for his/her spraying requirement. 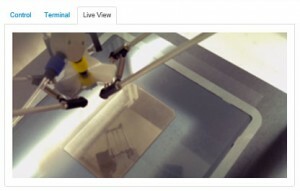 the iMatrixSpray delivers a live video stream which can be accessed from the web interface or by a streaming client (github/stoeckli/iMatrixSpray).